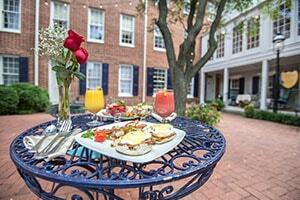 Guests at the 1840s Carrollton Inn may enjoy a delicious breakfast prepared to order and included with your stay. Order your full American-style breakfast to be served to you between 7:00 a.m. – 9:30 a.m. Enjoy your breakfast in bed in the privacy of your own room or you may sit at a cozy table for two in the historic first-floor parlor. If the weather is nice, have your breakfast in our outdoor courtyard garden and allow us to serve you while you read your paper in the morning sun. Choose from a variety of breakfast menu offerings to include thick slices of Italian bread French toast, buttermilk pancakes with blueberries, bananas, raspberries or chocolate chips, and the house omelet with Shitake mushrooms, onions, cheese, and tomatoes. We use fresh local ingredients in our breakfast dishes and organic herbs from Koinonia Farm located at our Baltimore County property, Gramercy Mansion.